Our Deluxe Yoga Mat has durability, stability and a high-tack, sticky surface with a soft feel making it the ideal mat for yoga. True yoga enthusiasts will instantly recognize the quality, making it our most popular yoga mat. Yoga mats are hand washable. 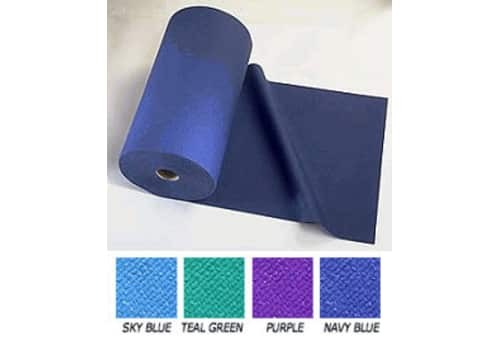 Our Deluxe Yoga Mat Rolls are 24" x 100' and 3/16" (4.7mm) thick. Our 2' x 100' (yes, that's 100 feet) rolls of yoga mats allow you to cut your own mats to any size you want. Perfect for yoga studios that want to provide longer mats to taller students and shorter mats to shorter students, even kids. You can easily cut these mats with a straight edge and a sharp knife (utility knife, xacto, etc.). Each 100' long yoga roll will yield 17 full mats, if all mats are cut to the standard 68" length. This Deluxe Yoga Mat roll has durability, stability and a high-tack, sticky surface with a soft feel, making it the ideal mat for yoga. True yoga enthusiasts will instantly recognize the quality, making it our most popular yoga mat. High quality closed-cell PVC vinyl gives it a soft cushion feel. Embedded fabric mesh provides more durability against tearing.